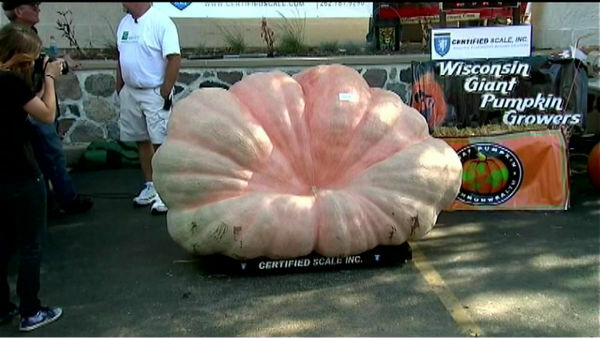 A giant pumpkin is bringing a "ton" of excitement to Cedarburg, Wisconsin. CEDARBURG, Wis. -- A giant pumpkin is bringing a "ton" of excitement to Cedarburg, Wisconsin. The massive pumpkin has broken a North American record at the Cedarburg Wine and Harvest Festival. It weighed in at over 2,000 pounds - roughly one ton - and is now the biggest pumpkin on record in North America. Gene McMullen grew the colossal fruit in Streator, Illinois. Officials said this is actually McMullen's second year in a row beating his own record. Last year, his pumpkin came in at around 1,600 pounds. McMullen says he feels like a lucky man.